As America is waking up to the truly apocalyptic devastation left by hurricane Katrina in Louisiana and Mississippi, lots of people are starting to question if things could have been handled better. It's starting to look that way. It's not often that we see a major American city being almost completely obliterated. Almost 80% of New Orleans is flooded. Biloxi has been devastated. Still, thousands of people were left behind, not enough preparations were made, and now we have evidence that budget cuts to FEMA and infrastructure maintenance may have precipitated the catastrophe in New Orleans' flooding. I just saw images of New Orleans on TV, a high-school completely devastated, and dozens of school buses scattered, submerged in the water. Why couldn't FEMA use these buses as resources to fleet people out of the city? Instead they hoarded those who were left to fend by themselves in the Superdome stadium. In addition to saving people ,all those buses would be now save and functioning. In the meantime, these poor people were left there without food or water, on their own. The richest country of the world couldn't even mobilize its own public resources (school buses, city buses, trains) to get its own citizens out of harm way. It's very sad and embarrassing. Louisiana authorities are talking about how the budget cuts in infrastructure (thanks to Bush) allowed the levees to breakdown, flooding the entire city. This lack of preparedness and resources is what's expected in a third-world country, but not here. The former major of New Orleans was just on CNN, very angrily calling on Bush to dispatch the army into the city. He complained that Bush only sent 3000 national guard operatives to the city, while rescue operations require 10 times that amount, and the city is being looted. The former major of New Orleans placed the responsibility of this mess directly at the feet of George W. Bush. 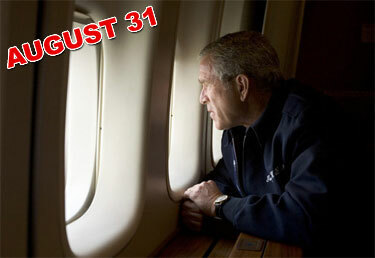 Which remind us, what has Bush done so far in this massive disaster? Well, he did cut some brush in his ranch while the hurricane was leveling a major US city. Then he said he would cut his vacation short, and dispatched a minor national guard operation that's insufficient for the massive task at hand. 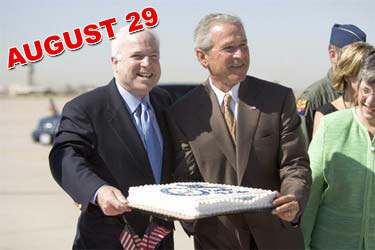 Then he had cake with John McCain. Cake tastes good! 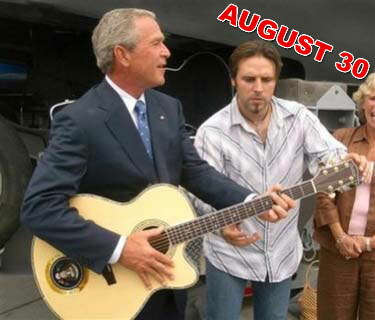 Then he played guitar with some country music dude! Then he said he would finally have a meeting to review the Katrina disaster, but it won't take place until later today, at 4pm, probably after his nap time. That is a whole three days after the disaster. Let it be said: despite the devastation that nature has inflicted in the area, this disaster has revealed a MASSIVE FAILURE OF LEADERSHIP, an embarrassing level of unpreparedness and lack of resources that SHOULDN'T HAVE HAD TO HAPPEN. It's sad and depressing to think that in the richest country in the world there's not a very well coordinated effort to face a massive disaster... and leadership is yet to be seen. Truly horrific pictures of the devastation of New Orleans after Hurricane Katrina.